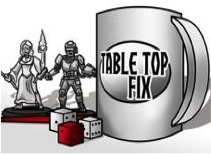 I was unable to celebrate Tabletop Day on Saturday in any organized fashion, though Joe was running an event. I have been busy with family things and Nick and his family were in town. 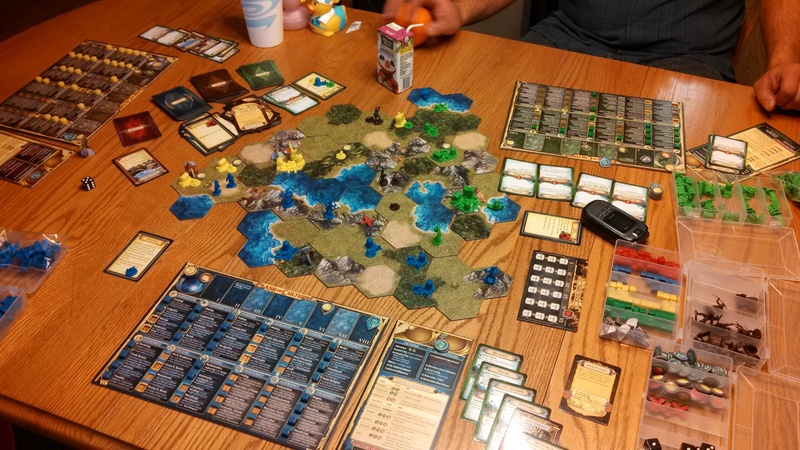 I did get to play a few games, starting with Clash of Cultures on Friday with Nick. 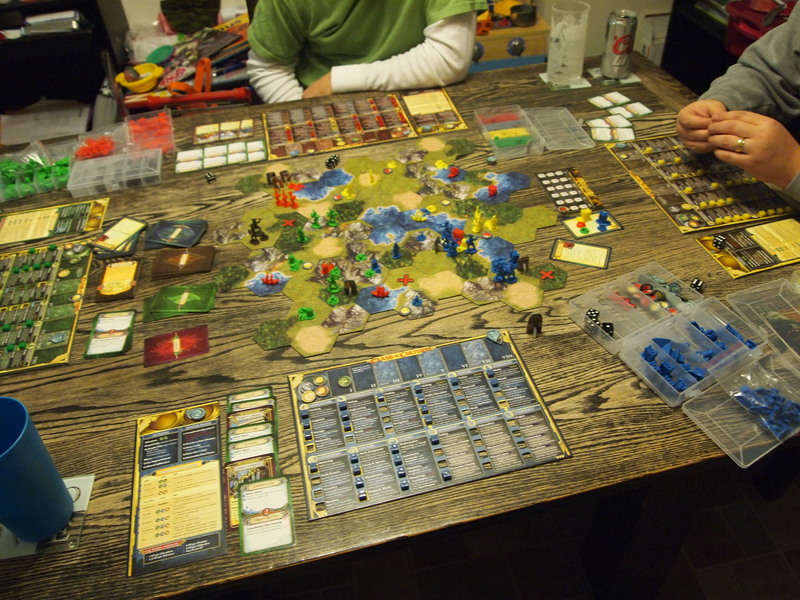 It was my first play with the Civilizations expansion, and Nick’s unfamiliarity with the game proved to be unfair. He was playing as the Celts and founding a bunch of settlements, but wasn’t defending them. I was focusing on boating with Carthage, and Nick didn’t realize that I could sail pretty much anywhere once I learned Navigation. He left two coastal cities undefended and I was able to sail in and claim them as my own. After that it was pretty much a forgone conclusion and we called the game. 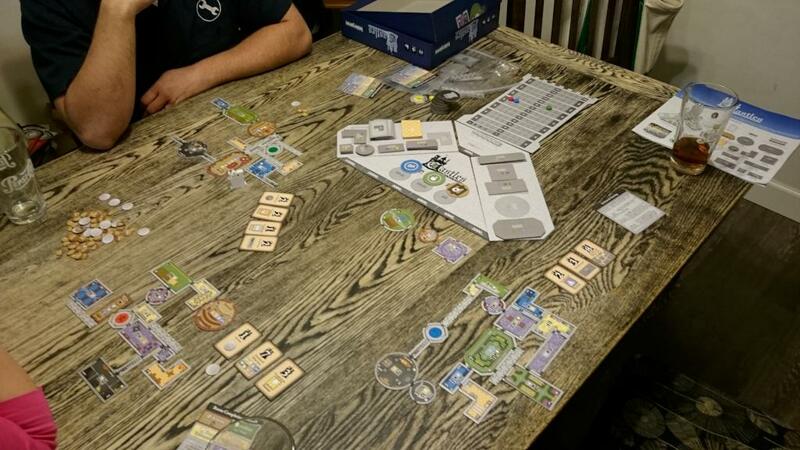 Then on Saturday, Laura, Nick, and I kicked things off with Castles of Mad King Ludwig. I had a decent castle going, but I was trying to complete the “one of every room size” bonus card. I was able to complete it, but at the cost of passing up on some high scoring rooms. Nick had a much better flow, and was able to snag a couple extra bonus cards that helped propel him to victory. 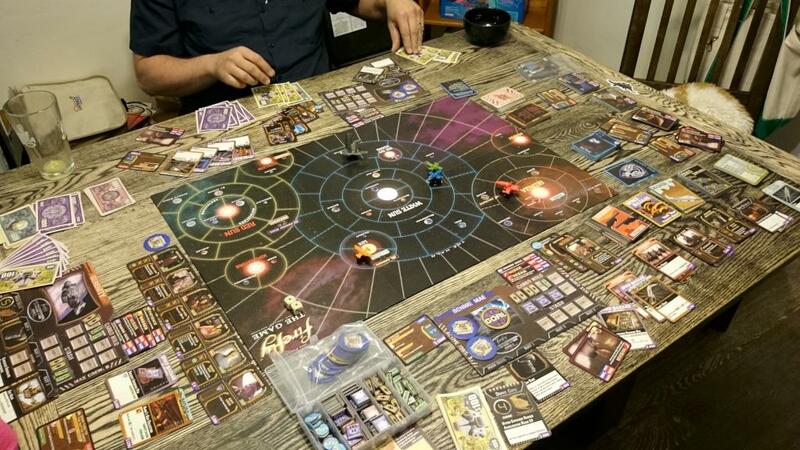 We finished the evening with Firefly. 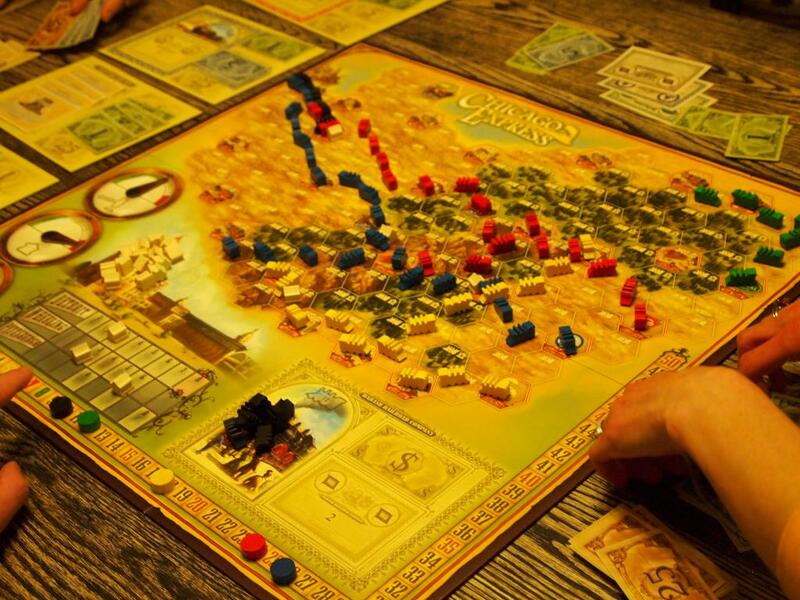 We were playing the Desperadoes story, trying to avoid the authorities and accumulate 15k credits before retiring. We were each doing our own thing. Laura was collecting crew to prepare for a big job. Nick was gathering a small crew and started missions early. I gathered a crew of mostly companions and planned to talk my way through trouble. Things were going well in general, though I did get ripped off on my high paying negotiation mission and only got paid half of what I deserved due to some trouble. Then the Reavers hit. Nick and I got hit hard when I drew the Reaver attack card. The deck was shuffled and I got hit again immediately. It was looking ugly, but Nick and I finally managed to escape the outer rim, but not before he was hit again, costing him two more of his crew. I finally made it to my mission location and was able to waltz through, thanks to a handy fake ID. That provided the last few credits I needed to end the game. Nick made one last push to close the gap, but was hindered by some Alliance entanglements and came up just short. First off, happy mother’s day to the mom’s out there. I was able to spend a little time with my mom on Sunday, so that was nice. 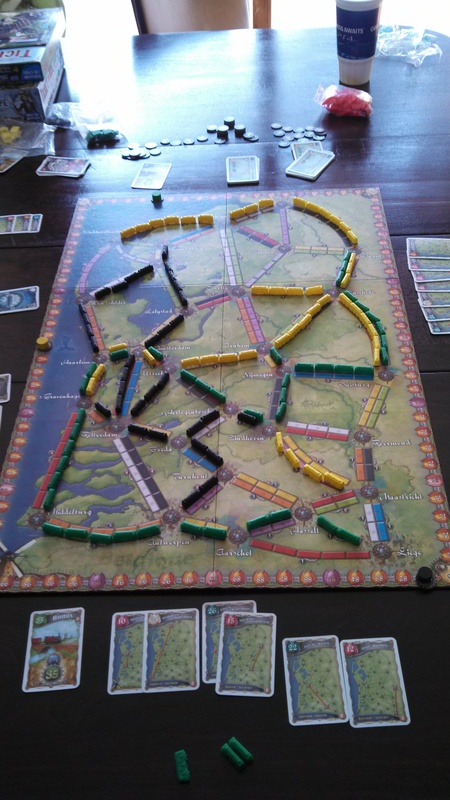 Our Saturday evening games started off with Chicago Express with Gina, Joe, Louis, Kevin and I. I started off poorly with the green company, while Louis, Gina, and Kevin were progressing the red company quickly to Chicago. They stalled out, though, as I bought into blue with Gina and Louis. Blue managed to get to Chicago first earning a big dividend. Kevin quickly bought into black, and expanded to Chicago for a payout, which subsequently prevented red from ever reaching Chicago. 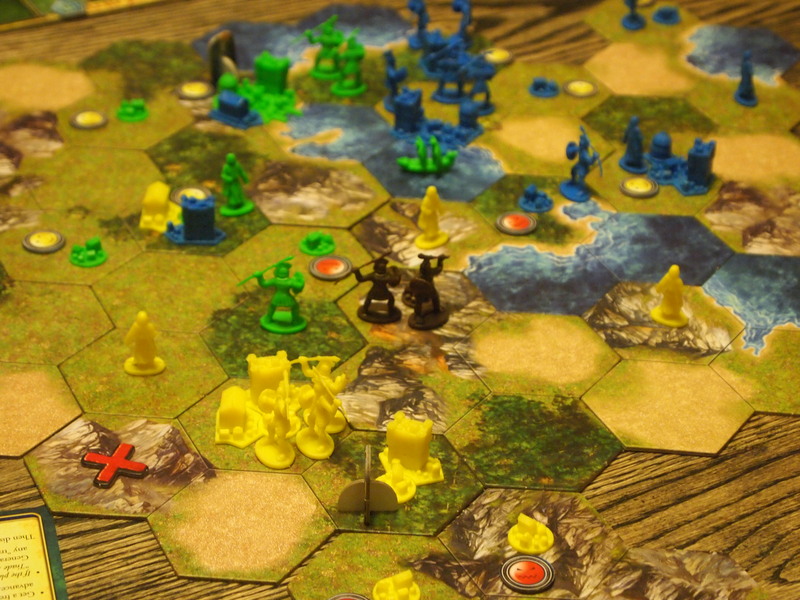 During all of this, Joe had a monopoly in yellow and ended up trapped in the southern portion of the board. 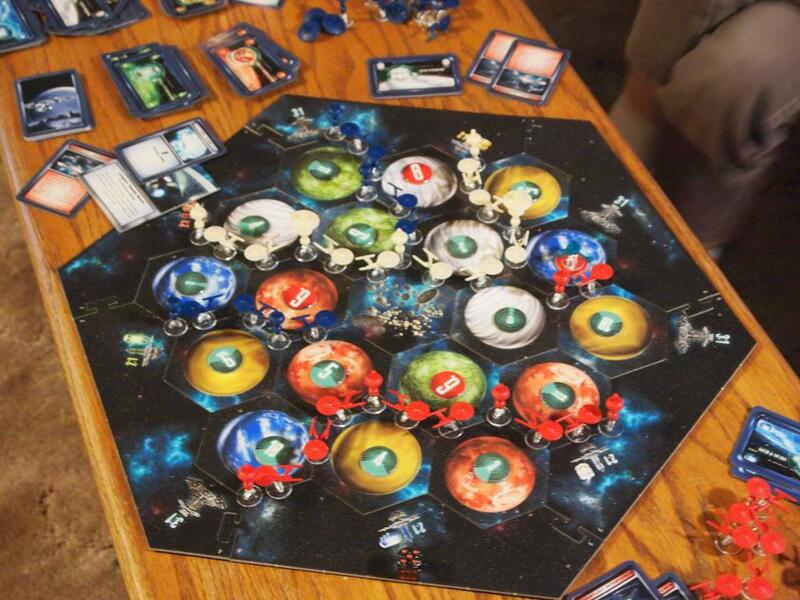 He never really managed to get out, and Gina’s majority in blue ended up providing her the wealth to win the game. Gina headed to bed at that point, and the rest of us played Clash of Cultures. I started off with the intention to develop some trade routes, but Joe put that to rest with his only military unit to score an objective. Louis had been developing his military pretty heavily, and Kevin wasn’t far behind. Louis moved toward Kevin, but was able to repel him, causing him to direct his attention to Joe instead. There were a couple barbarian settlements just between Kevin and I on a choke point between our settlements. He took one, and I took the other. We then traded cities back and forth for a couple rounds until I managed to repel an attack from four of his armies with only two of my own. While Kevin and I were spending our time building and rebuilding our forces, Joe had been developing a peaceful society. He was about to really expand heavily when Louis attacked and Joe couldn’t defend. Louis managed to take two of Joe’s cities before Joe could stabilize. Kevin and I eventually realized we were getting nowhere, so we stopped attacking and just built up. I was able to score a couple objectives because of this. One was for having the most fortresses, which was only possible due to a lucky event draw providing the resources needed. The game finished with Joe, Louis and Kevin all tied at 24 points. I finished in the lead with 35. It was one of the more memorable games we’ve played. 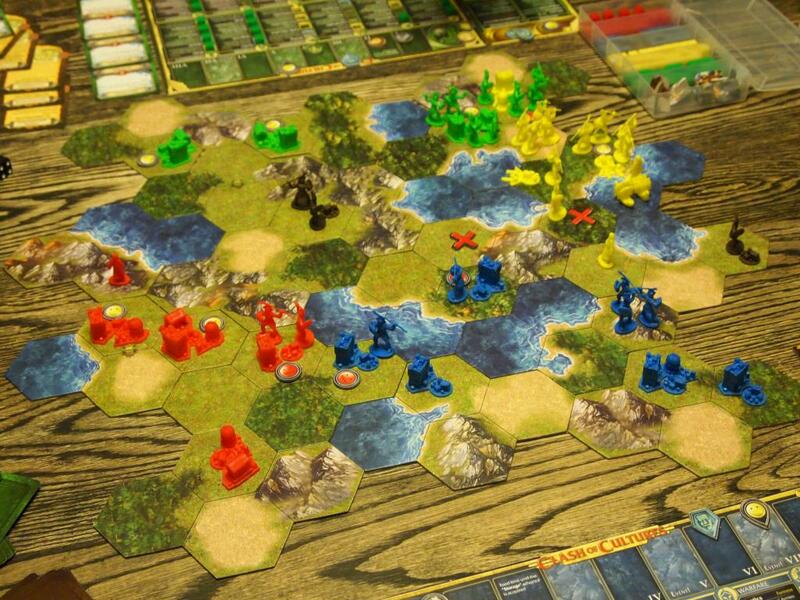 Kevin, Joe, Louis, and I decided on Clash of Cultures Saturday night. It started off pretty peacefully. 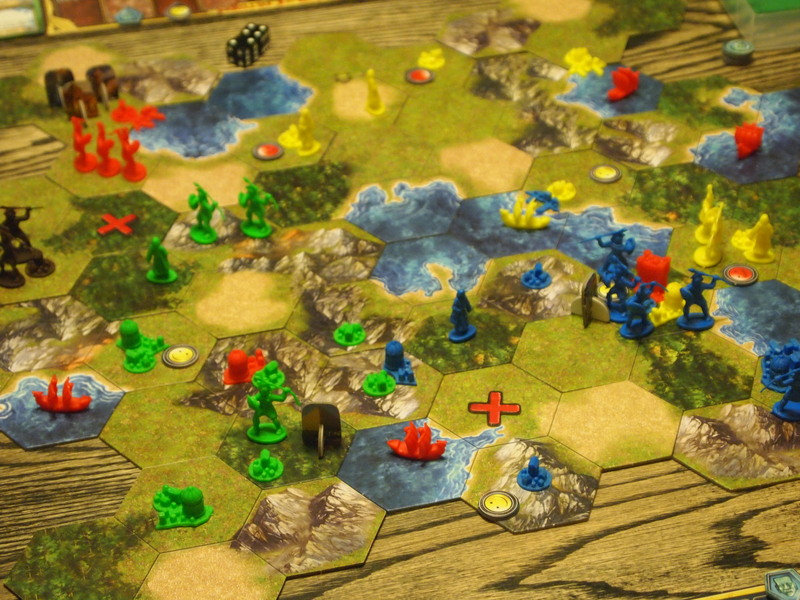 A mountain range separated me from Louis, and the middle was unexplored for much of the game. Eventually Joe and Kevin ended up next to each other. Kevin took the first aggressive action in attacking Joe. He was defeated and Joe took advantage of his weakened state to take Kevin’s city. I had built up a nice city in my corner and was using my economic liberties for income. I was able to build the great mausoleum wonder, but building armies to defend was difficult with limited access to ore. I did take a couple of Louis’ nearby cities to dissuade him from attacking my capital. Kevin had climbed back into it and was giving Joe trouble, but Joe decided I was the biggest threat and started working his way over to my city. I was barely able to build an army to defend and survived his attack with a single army remaining. I finished the game with 38 points, while Louis had 34, Kevin had 33, and Joe had less than 20. I had forgotten to post my March wrap up, so here it is. Flash Point was definitely the game of the month. Nothing else even comes close. New Years Eve was going to be a quiet one, but after a last minute invite to go with Gina and the kids over to Joe’s, the games were afoot. Phil join us as well and we played a quick game of Hawaii. I managed to grab the spear god, and spear huts early. Joe headed for the boats, and Phil was picking up income buildings to fill all of his village spots. 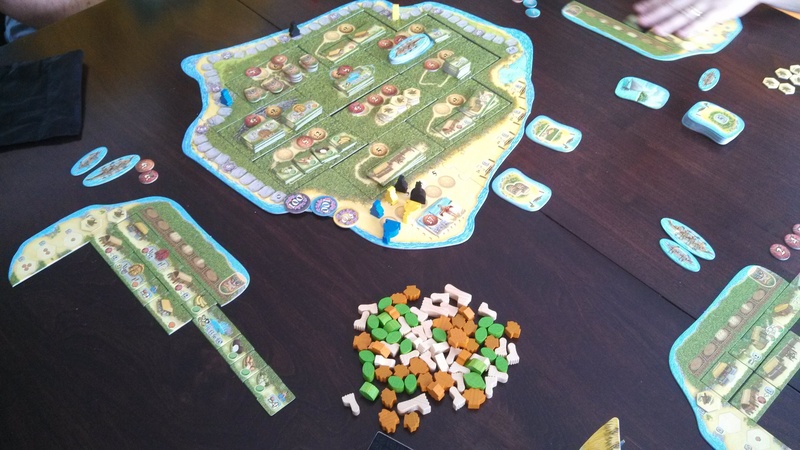 I was able to maximize my spears to get six points per buy most times and cranked out two decent sized villages, one full of delicious fruits. Joe had a single massive village, with nearly every tile. I had racked up a ton of points with my spears, though, and even with a nice end game bonus he wasn’t able to overtake me. After lunch, Phil had to leave, and Louis joined us and brought Ticket to Ride: Netherlands with him. It was an interesting new take on the game, with tolls that needed to be paid, and tons of double connections. I wasn’t able to decide on my initial routes, so I kept them all, which proved to be a mistake. I had a decent going, and nearly got them, but actually ran out of trains before I could complete them. Louis had completed a bunch of the long connections around the outside of the board, and did so without spending much of his toll funds. Joe completed all of his routes for over 100 points, but spent all of his tolls. Louis ended up with the toll bonus and the overall victory. After losing 45 points from uncompleted routes, I came in dead last. 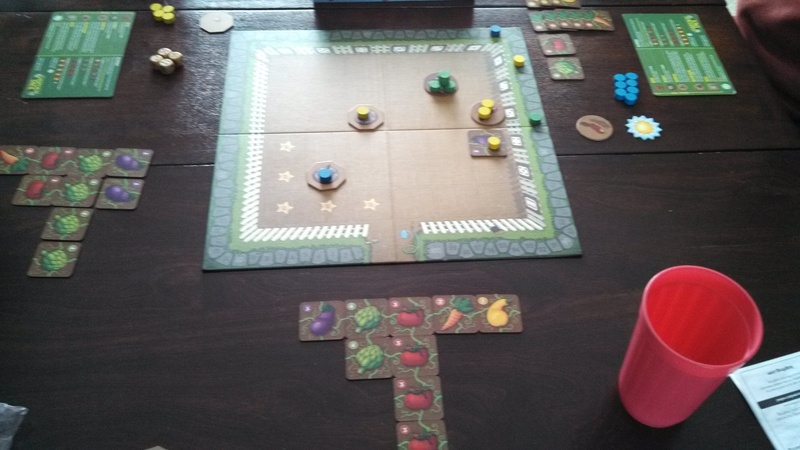 We finished the afternoon with Garden Dice, a neat little game where you are trying to plant seeds to harvest vegetables for sets. The trick is that the dice decide where and what you are allowed to plant. I was going for one of each plant, and got out to an early lead with a double pointed artichoke. Louis and Joe had built a massive network of plants in the middle of the board, that I had managed to sneak a few plants into before Louis harvested them for a big bonus. Eventually, I ran out of good things to buy and plant, so I dropped my bird on the board and ate a few seeds, cutting into their ability to complete sets. The big one, though, was when I ate Joe’s eggplant seed that would have been worth double for harvesting and completed his set of one of everything. The game ended with Louis and I both having a full set of vegetables and a set of four vegetables (artichokes for him, and tomatoes for me). Joe had four squash and five carrots. I had lead Louis by two going into the final scoring, so having identical vegetable sets, and my sun bonus lead to my victory. 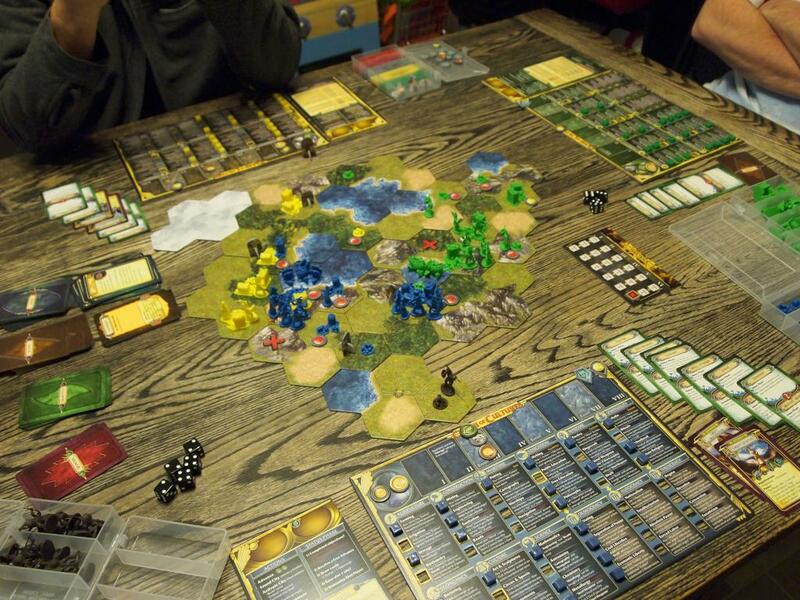 Finally in the evening, Kevin, Joe, Louis and I sat down for a game of Clash of Cultures, while the girls chatted. Everyone was pretty militaristic in the game, which was an oddity. I was attacking the barbarians around Louis, but hadn’t attacked him directly. With no barbarians to attack, though, Louis decided to go straight for me, taking one of my cities after a pathetic defense on my part. 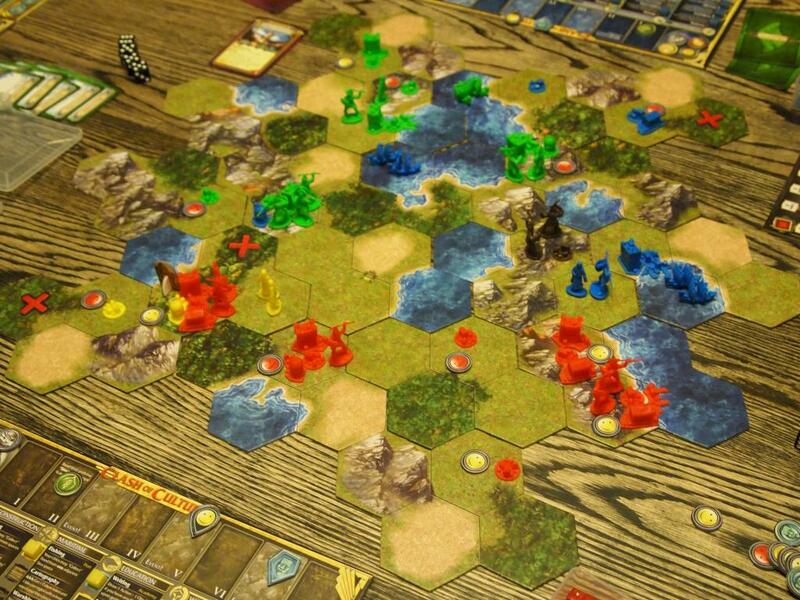 Kevin and Joe had been pretty content to just sit with trade routes to each other, but in the last round Kevin shipped an army over to take one of Joe’s cities. Joe did take it back, but Kevin had the last chance and flipped it again. I built the Great Mausoleum, thinking it’s ability would defend me long enough to build an army, but that was a mistake. I should have built the army first, because Louis was able to gather what he needed and marched right in to take it. The game ended with Louis playing a Negotiation card on Kevin, preventing Kevin from marching on the city with the Wonder. I had one settlement left at the end, Joe was second to last, with Kevin taking second and Louis winning it all with 36 points. I hope you enjoyed your time this Thanksgiving holiday. 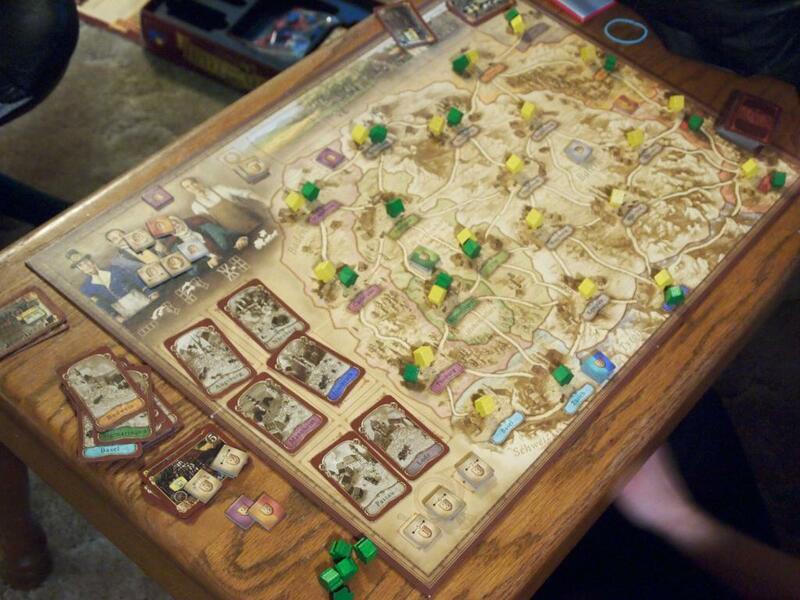 On Thursday, Gina and I played a quick game of Thurn and Taxis, followed by Star Trek Catan with Gina and her mom. 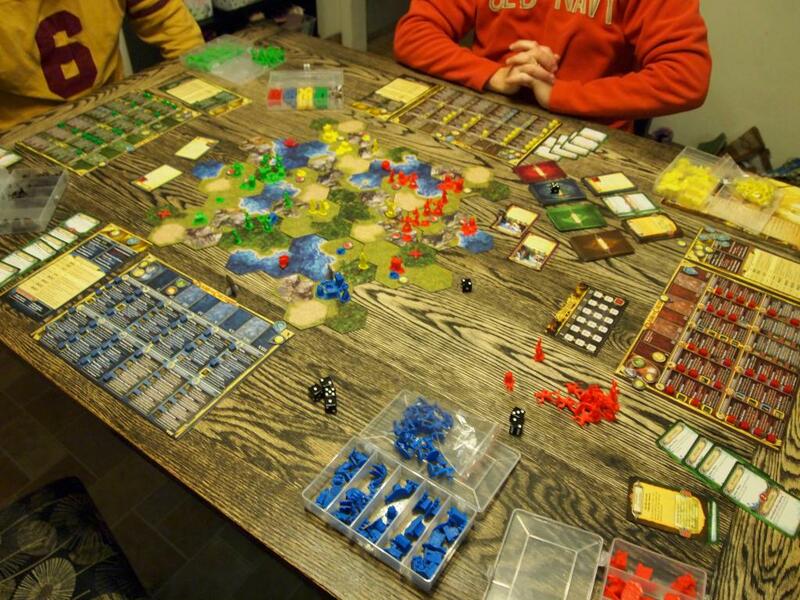 I was able to win Catan, taking advantage of a few ill advised trades by Gina ‘s mom. Then on Saturday, Joe and Kevin joined us. We played Village first. I was trying to avoid the market, and instead focused on using the council to feed my travel. I also had a bunch of family in the church. I did well, but Kevin and Joe were working the market with Kevin getting the best deals. Kevin ended up tied with me for first, and had the tie-breaker with the market sales. Kevin, Joe, and I followed that with Clash of Cultures. Things started off peaceful. I was working to get taxation and trade routes to fulfill my objective. Kevin ended up surrounded by barbarians, so he went military first. Joe and I were for next to each other, and it very enticing to attack. Instead I just used him for the trade routes, and built a big defensive army. Joe did try to attack twice, but I repelled him both times. Kevin was also mounting an offense in the other side, so I needed to defend there as well. 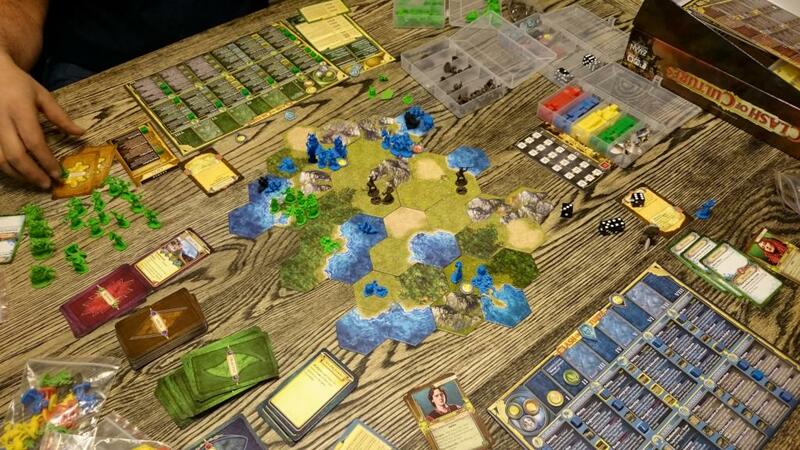 Joe and I both managed two wonders, but I had completed all of my objectives and had the bigger civilization. I took the win with 51 points. Gina was out for a “girl’s night” Friday, so Joe and Louis joined me for a games. We started things off with Clash of Cultures. No one was being terribly militaristic, so we were pretty much free to develop as we wanted. My starting objective was to get all four Economics advances, so I pushed for taxation quickly. I had a bunch of small settlements in a clump while I also developed towards Nationalism to get mood tokens for building armies. This didn’t quite work as I planned, and I ended up with a bigger focus in the Education group. Louis was nearly completely walled off with water, but started pushing armies toward Joe, defeating barbarians along the way. Joe and I both managed to build Wonders, but it was Louis who ended up winning. He had a ton of medium sized cities, a bunch of advances to go along with a full set of completed objectives. Louis had to take off, so Joe and I broke out The Manhattan Project. Joe decided to airstrike my stuff early and often, so I countered by spying heavily. I rarely allowed him access to his buildings and he had the best access to the limited selection of mines. I was able to get two uranium bombs with an early bomb design, and then built one quickly. 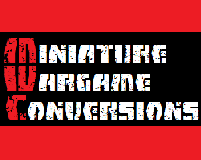 By then, things were shaping up well for my game, while Joe was just starting to get his plutonium production rolling. Joe was able to get a small bomb built and then tested, and finished building his second a few turns after I had my second. By then, though, I had another uranium bomb in the works and Joe couldn’t slow me enough. I was able to build it and then it just took another couple turns to gather the resources to load it for the last five points and the win. Gina was home by then, so we played a quick game of Dominion with no expansions. When I bought a Chapel early, they knew what I was up to, and tried to quickly end the game. 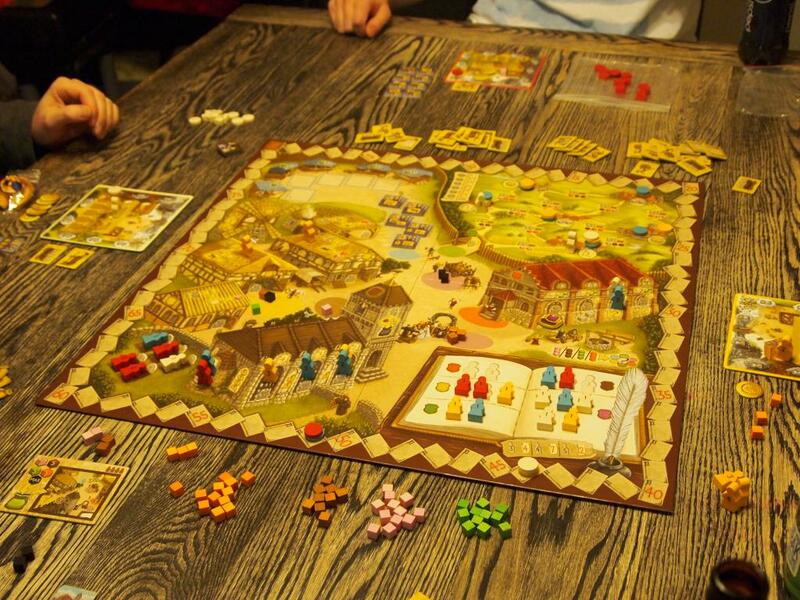 I was able to get my engine rolling, though, with Villages, Markets, a Council Room and a couple gold. By then I was able to play the entirety of my minuscule deck for 11 coin each turn and proceeded to pick up a Province and Cellar each turn. The Cellars kept things working smoothly, and I was able to quickly rack up the Providences. Even with that, things were close. Joe and Gina had an early start, buying Duchies and Provinces along with me. I did end up winning, with 36, beating their 34 and 33. 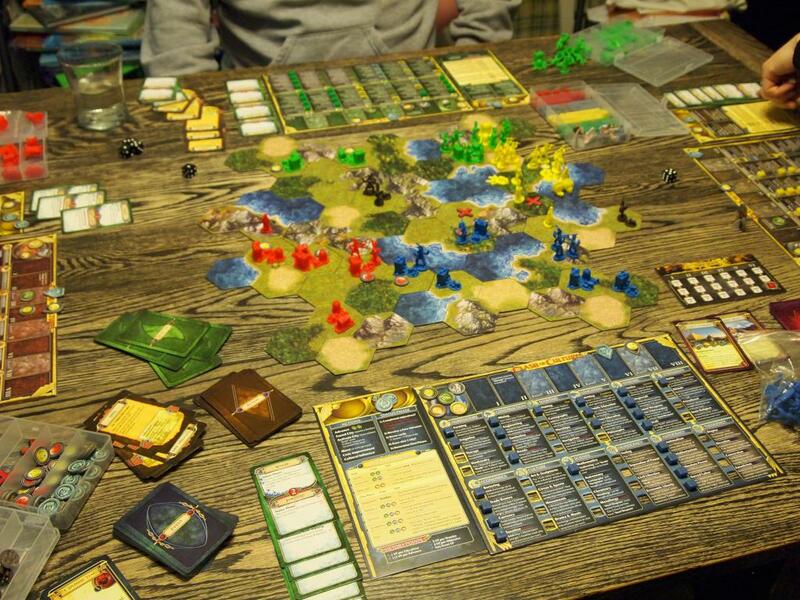 Then Saturday night, Joe and Phil joined us for another game of Clash of Cultures. Again it was a fairly peaceful game. I went straight for Economic Liberty and a size 5 city. Joe was headed for a heavily Trade focused strategy with boating, and Phil was pushing for Taxation. Gina was a little less focused, but did build a bunch of temples and Theocracy advances. Phil and Gina switched gears part way and started building armies to go after Joe for some reason. I had built some fortresses to dissuade Gina from attacking me, and it seemed to work. 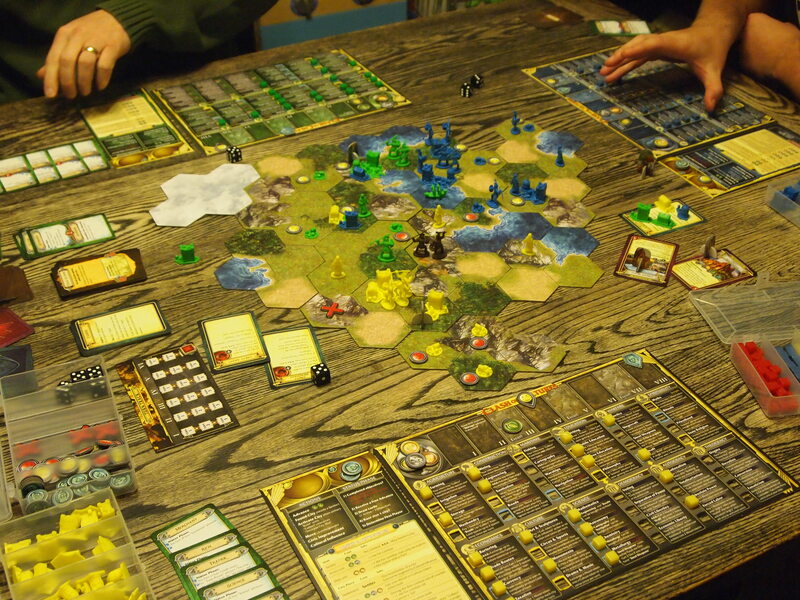 Joe ended up with a single city, but was still able to pull in a ton of resources with Trade Routes and Cartography. He somehow managed to build three wonders in his single city before we realized that wasn’t legal by the rules. While this was going on, I had two wonders built in my two major cities, with enough armies to defend them for once. Phil ended the game on my doorstep, but decided against trying for the attack. The win was mine, with a solid 46 points. The final game of the weekend was Dixit with my family after an early Thanksgiving’s day celebration. I had been trying to get them to play for ages, and we finally had the chance. Everyone loved it, and my mother already is asking for more new picture cards. We were away from home this weekend so Gina could run in a 10k race. While we were out, we were able to play some games with Nick, Laura, Dana and Phil. Friday night was dominated by a game of Cards Against Humanity with everyone. It was crazy fun with plenty of inappropriateness to go around. 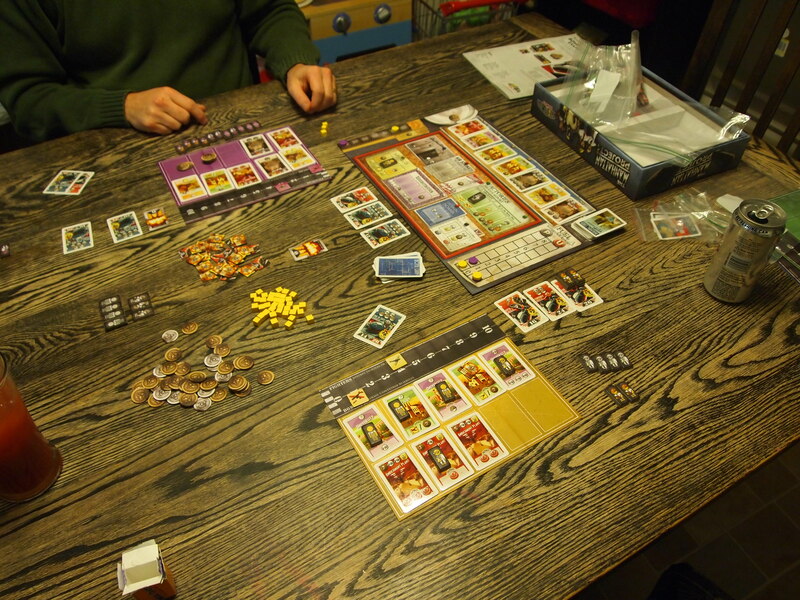 Then on Saturday, Nick, Phil and I played Clash of Cultures while the kids were all playing together. 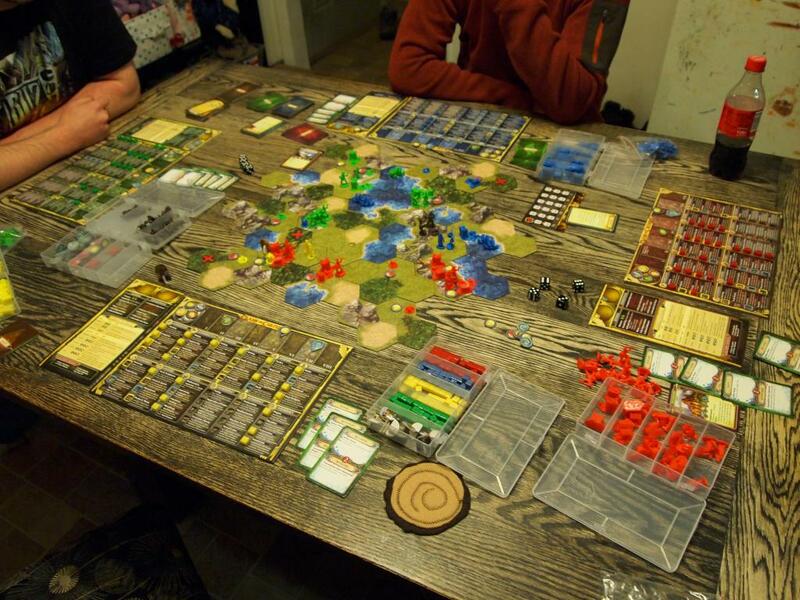 It was a very peaceful game, with only Nick and I building any armies to defend ourselves from barbarians. I upgraded my economics advances to grab Taxation. With that I was able to essentially ignore the happiness of my cities, which was good because I was hit with both an earthquake and a volcano during the game. Nick and Phil decided to push the Democratic route and both were picking up a bunch of cheep resources with Economic Liberties. 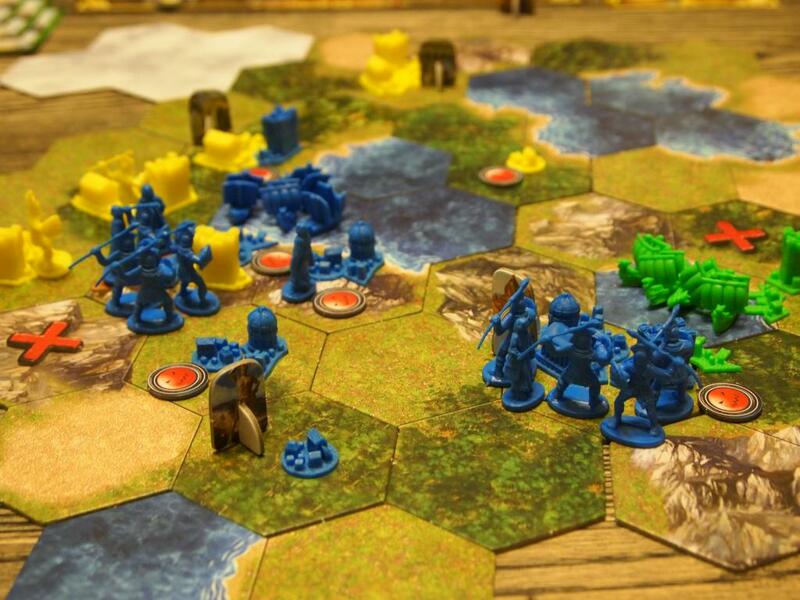 Nick was struggling a bit to find his groove, and it wasn’t helped that he spent resources building armies to fight barbarians and then failing twice. Phil, on the other hand, managed to build two Wonders, while I was only able to build one. He also built the first, just before I could, robbing me of a potential objective. When the game ended, Phil had just barely squeaked past me, winning 45 to 43. Nick brought up the rear with 32. 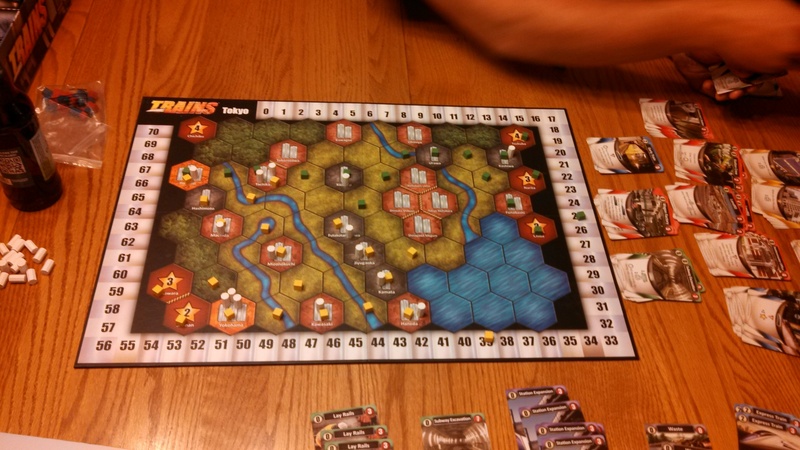 After a break for dinner, Nick and I started the evening by learning his new game, Trains. It was definitely an interesting take on the deck-building genre. Very reminiscent of Dominion, but the ability to focus on the board rather than just point cards makes for some interesting decisions. I was able to build more stations, making my track more valuable in the end. Dana had called it a night by this point, so Nick, Laura, Gina and I played a quick game of Love letter, won by Gina followed by Phase 10. I was getting terrible luck with my opening draws, and was well behind when Laura phased out for the win. Phil had returned and we finished the night with The Resistance. I was a rebel, and got us off to a great start, succeeding the first mission with Gina. Gina then sent Nick and I on a mission with herself, for the second success. Phil failed to put together a good team, while Nick sent Laura with us, resulting in a failure. Laura put Phil on the team for another failure, but I was able to seal the deal for the rebels, sending Nick, Gina and Myself on the final successful mission.